Islam is called a way of life for a good reason. The principles and teachings of Islam provide mankind with the perfect guideline to ensure we lead a healthy and balanced lifestyle. One of the ways Allah (swt) has done this is by encouraging modesty and moderation in everything that we do. In other words, Islam gives us the strength to fight the consumerism monster in the sacrificial battle we face in our everyday lives. As our Creator, Allah knows best that the desires of the children of Adam are indeed insatiable but He also granted us with intelligence and self-control so that we may be tested in this dunya. As part of Allah’s Guidance, He has given us the Holy Qur’an, Sunnah of Prophet Muhammad (saw) and parables of prophets that we may receive guidance from. 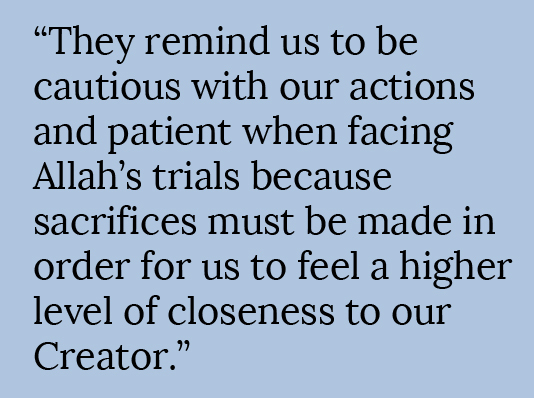 To guide us in our lives, Allah has taught us the meaning and importance of sacrifice. “O our Lord! I have made some of my offspring dwell in a valley with no cultivation, by Your Sacred House, in order that they may offer prayers. So fill some hearts among men with love towards them, and provide them with fruits, so that they may give thanks. After many years, Prophet Ibrahim (as) returned to the valley known as Makkah where he was finally reunited with Ismail (as) who had already grown to become a fine young man. The father and son were overjoyed to be with each other again. But Allah’s test for Prophet Ibrahim and Prophet Ismail was not over. One night, Prophet Ibrahim dreamt that he sacrificed his beloved son. Upon waking up, he consulted Ismail (as). They both understood it to be a message from Allah (swt) and without hesitation Prophet Ismail said: “Do what you are commanded, you will find me, inshaAllah, one of the steadfast.” (Holy Quran, 37:102) SubhanaAllah! They both submitted to the Will of Allah; one was ready to sacrifice his own flesh and blood while the other was ready to sacrifice his life. These are the biggest sacrifices anyone can imagine but their faith in Allah (swt) was stronger than their fears and therefore Allah rewarded them by miraculously saving Prophet Ismail by replacing a big sheep in his place. Allah called upon Ismail’s father: “O Ibrahim! You have fulfilled the dream! Thus do We reward the good doers!” (Holy Quran, 37:105) As we now know, Eid ul-Adha became an annual Islamic tradition to commemorate this miracle. The beauty of Islam lies in its power to be relevant throughout many centuries, for all time in fact. The lessons embedded in the story of Prophet Ibrahim and Prophet Ismail in the Holy Qur’an can be applied even in today’s social settings. 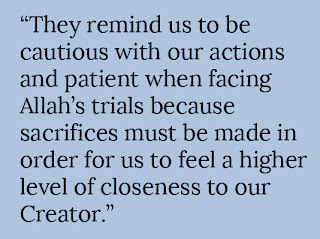 They remind us to be cautious with our actions and patient when facing Allah’s trials because sacrifices must be made in order for us to feel a higher level of closeness to our Creator. But for Muslims, Islam is our way of life. From the way we dress to the food we eat, our faith has taught us to spend our wealth and consume what Allah has provided in moderation. It is time for us to change our consumer mindset and apply the principles of sacrifice and moderation into our lives so we, as ordinary everyday Muslims, can be part of a movement that supports sustainability and green living. 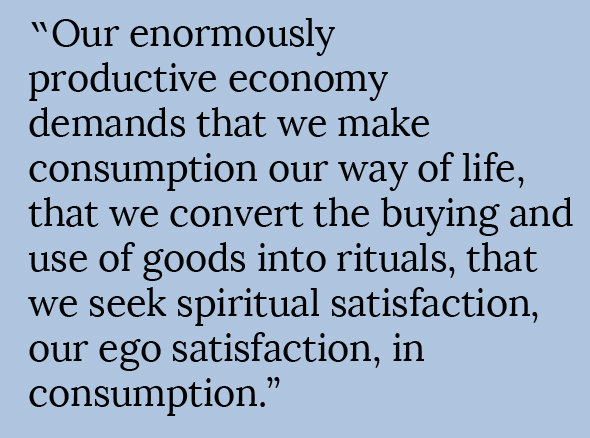 For example, collaborative consumption is the revival of a traditional practice. It is a new green consumption trend which promotes the reduction of “throwaway habits” and the idea of temporary ownership by carrying out bartering, sharing, exchanging, lending, swapping, renting and gifting through network technologies. Examples of collaborative consumption in Singapore and Malaysia can be seen in several initiatives and there is something for everybody. 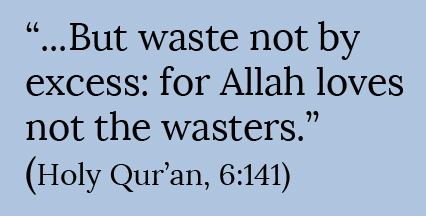 A movement called Waste is Not Waste helps businesses and organisations in Asia reduce, reuse and recycle waste. The Singapore-based, MyRideBuddy, is a system which assists like-minded residents of Singapore to carpool or taxipool so they can reduce their carbon footprint and save some money too. Mums-to-be can also take advantage of collaborative consumption by being a part of Maternity Exchange, a retail concept which offers the option of buying or renting maternity wear. There is even something for techies in Singapore who want to benefit from Hackerspace.SG’s space which encourages communal interaction and collaboration between tech enthusiasts. There is much more to gain from collaborative consumption because this system of consumption, distribution and lifestyle based on sharing fosters trust between people in a modern society that is characterised by individualism and alienation. These are some of the side effects of consumerism – a way of life that is centred on the notion that our worth and identity as human beings are measured by the things we own. With the advent of popular culture, it is not easy to defy this materialist ideology but Islam was sent to advocate that the human value is not measured by one’s physicality or wealth but by one’s good deeds and intentions (Sahih Muslim). Moreover, the concept of sharing is not foreign to Islam because it is considered a form of charity to help not only other people but also any of Allah’s creations on this Earth, which includes animals and the natural environment. After all, sharing is caring. Asalamu alaikum thank you for sharing your wise words with everyone, pop over and have a look at my new bloglet "See My Swords And My Arms" Feel free to leave a comment or 2. Thank you Shahiarh for explaining why the Eid ul-Adha is celebrated.It's incredible the sacriface the prophet Ibrahim (as) and the prophet Ismail (as) were ready to make.How heart warming it's to know that then Allah (swt) replaced Ismail (as) by a sheep,so that we can see,feel and understand how compassionate He is. 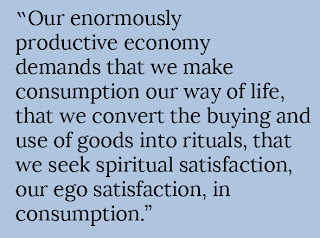 It's also very true that in our modern society we rarely are ready to make a sacrifice by living a more modest life - but when we do we understand how much more we gain from such a way of life.It's so much more rewarding if we are more consciuos about how we spend,use,reuse... what we already have.It gives you a strong sense of power,because you get the feeling that all in all you can manage life also with less.On the other hand when you are too concentratded on gaining material things,the power you get from this is just temporary.It's true, paradise comes true sacrifice :)! Jasmina, thank you for sharing your thoughts, hun! I love everything you said.. especially about feeling a sense of empowerment when you are able to make a sacrifice and be more cautious about our consumption habits. And you're also right about the temporary gratification from buying more things. Read Surah At Takathur, my dear! Thanks for a thoughtful piece. Very few Muslims are engaging consumerism in a critical way - keep it up iA!